Between the construction and service department making things happen, they made everything come together in perfect order to meet my needs. The communication from everyone at Blue Haven was by far the best I’ve received from any construction company before… The office staff went above and beyond for me and that’s exactly what I look for in a companies I do business with. Serving homeowners throughout the parishes of Bossier, Caddo, De Soto, and Webster, our family-run pool-construction and service team specializes in building complete aquatic resorts custom-designed for each family’s backyard and lifestyle. As a custom pool builder, we’re dedicated to providing our clients with top-notch gunite pool craftsmanship, time- and money-saving technology, and friendly aftermarket support from our family to yours. From your initial pool build, through the life of your backyard resort, you can count on our hometown team of professionals. Our family business operates with deep faith, integrity, and strong moral values, and we would love to have the opportunity to earn your business and serve you. 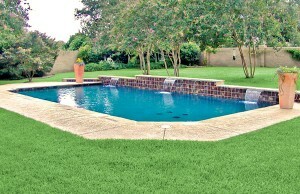 Why choose Blue Haven Pools for you pool & spa contractor? The bottom line is we are well-qualified to successfully tackle any swimming pool project. We are licensed by the Louisiana Board for Contractors, and our operation boasts an A+ rating from BBB Northeast and Central Louisiana and the Ark-La-Tex. 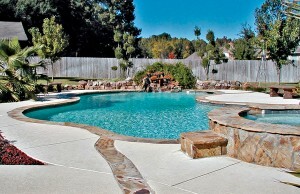 We build a wide variety of gunite pools & spas in all sizes, shapes, and styles. From flagstone-covered tanning ledges to custom stone waterfall grottos, gunite’s superb versatility allows you to have a wide choice of decorative elements in your backyard retreat. One favorite among Shreveport/Bossier homeowners is our individually hand-constructed mosaics. We craft the colorful mosaics in the shape of animals, plant life, floral patterns, and religious and cultural symbols. When it comes to the interior finish on your pool, you can have traditional marcite or upgrade to lasting, color quartz or pebble material. We can also build your patio and related features such as fire pits, pergolas, walkways, and retaining walls. Our roots in the community run deep and our reputation for pool design and construction extends for many years. 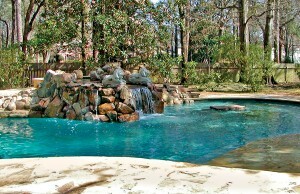 Homeowners in every town along the I-20 in northwest Louisiana have turned to us for building their private pool & spa. Along with building new pools & spas, we provide an array of related services. We offer top-to-bottom pool renovations, complete equipment modernizations that update aging systems with more efficient, more automated options. Other offerings include pool openings & closings, weekly pool service, conversions from chlorine to ozone or saltwater, and VGB main drain updates. Our office is authorized as a warranty station for Hayward pool equipment, too. We know that every backyard is unique, and prospective pool buyers have lots of questions. It’s important that you are both informed and comfortable with your pool-buying experience, so we will walk you through the planning process and the many design option you have with a gunite pool. Another way we help guide you is with 3-D software design presentations. This program will virtually immerse you in your future backyard and pool: Design choices that are hard to imagine—from rock waterfalls to the color of the pool’s interior surface—spring to life in full, multidimensional color. Let us help you get started on a new pool & spa or renovate the one you have. 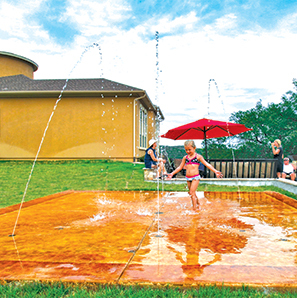 Would you like a special backyard amenity that mimics the experience of a miniature aquatic park? A splash pad consists of an outdoor concrete floor from 500 to 2,000 square feet equipped with water features that spray several arcing water streams. In the Louisiana heat and humidity, your kids will delight in running through the sprays of water and cooling off.